Let’s face it, these kilns are heavy!. The last thing you want to do is to start wrestling around with them to get at a component that needs to be replaced. All Scarab kilns are designed with a Removable Chassis which holds all the main electrical and electronic components. Just remove the screws that hold it in place and slide it out. You can even disconnect the power cord and ship the whole thing back to Skutt for testing if necessary. 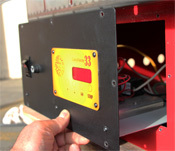 One of the most problematic components of kilns has traditionally been the relays. Mechanical relays have a limited life which is why Skutt has upgraded all Scarab Kilns with Solid State Relays. These relays or kept cool with a fan mounted in the side of the kiln (not necessary on the Micro Scarab because the Amps are so low). The Secondary Point Rests, another unique design of Marcel Braun, are generally ordered on just about every Scarab that goes out of here. 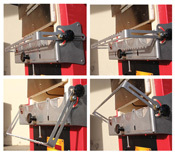 Flameworkers love its ability to hold long handles, preventing their work from popping up off the floor. Its well thought out design allows you to move the rest to almost any position you want. It not only moves in and out but also moves up and down. The scalloped edge ensures that your rods will stay in place.. 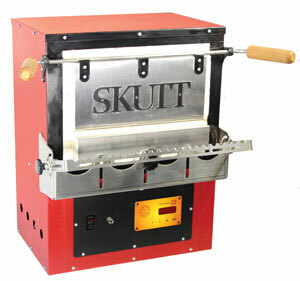 The Studio Series kilns are the most popular among the serious home fusers. Their economical price coupled with their large firing chambers make them flexible and affordable. Balanced stainless steel main door that opens and closes to a tight seal with ease. Powder coated for durability and is more environmentally friendly. Balanced wood door handle that's cool to the touch. Easy-Glide point rest with an optional 4" rests for more loading flexibility. Re-engineered hinge is smooth and precise. New Secondary Point Rest smoothly moves up and down, and in and out with ease with new scalloped profile. Vent holes keep electronics cool. Slide-out chassis allows easy access to components. Easy to use controller designed by Flame Working Artist Marcel Braun specifically for Borosilicate Glass. "You Just Press GO!"